You can’t walk on it, but it’s some of the most lucrative “real estate” in America. Two months ago, this real estate turned every $1 invested into $5 — in a single day. And while the opportunity in this real estate has come and gone, it’s a useful case study… because similar opportunities are on our radar this summer. The “real estate” we’re talking about is wireless spectrum for 5G mobile phones — the next generation of wireless technology. 5G offers data speeds 30–50 times faster than existing 4G networks. They can accommodate the 10-fold increase in data traffic coming between now and 2019 — that’s an estimate from Cisco. A few years ago a far-seeing company called Straight Path Communications (STRP) snapped up huge swaths of this wireless spectrum — confident that one day one of the Big 4 providers of wireless service would come knocking on its door. AT&T knocked on April 10, offering to buy out the company at $95.63 a share — a 162% premium over its share price the day before. Soon, STRP was the object of a bidding war. In the end, Verizon won out on May 11 with a bid of $184 a share. “That’s a 404% premium to Straight Path’s starting stock price,” points out our small-cap specialist Louis Basenese. The mainstream financial media wrung their hands about whether Verizon was overpaying for STRP’s assets. At the time, Louis was wrapping up a seven-year project — keenly aware of how lucrative the right takeover target can be. “Nothing jolts a stock higher than an unsolicited takeover offer,” says Louis. And there’s no better time to seize on takeovers than now — at the outset of a new takeover boom. And that $800 billion is a lowball estimate. As we mentioned a week ago, Bain & Co. pegs the number at $1.5 trillion. And at the ideal time to unveil the fruits of Louis’ seven-year project. 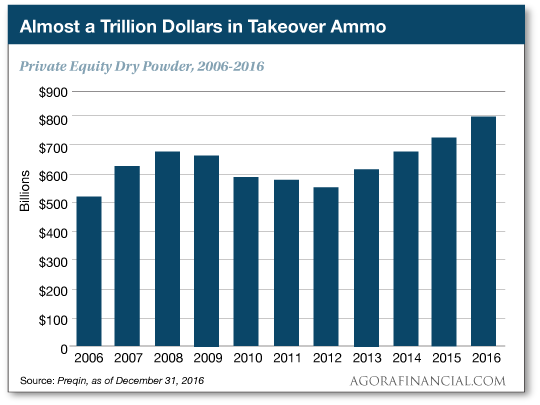 Not only does it identify takeover targets in advance, it drills down to the best of the best — the ones that could multiply your money five-or 10-fold. In a single day. The Federal Reserve has committed its ninth flip-flop going back to May 2013, by Jim Rickards’ count. As we mentioned yesterday, Fed chair Janet Yellen told Congress that she’s willing to dial back on interest rate increases if inflation stays weak — essentially taking a September rate increase off the table. After seven months of tightening monetary policy, the Fed is back in easing mode. Recall that the Fed is keen to raise rates so it can lower them again whenever the next recession rolls around. But by raising rates too fast, the Fed might trigger the recession it’s preparing for. “The Fed tightens as much as it can,” says Jim, “but then backs off when signs of slow growth, disinflation or disorderly markets appear. Then the Fed flips to ease until the danger passes and then goes back to tightening. Flip-flop, flip-flop. “Meanwhile, the markets have figured this out and are calling the Fed’s bluff. No sooner had Yellen given her remarks yesterday than the stock market rallied to new all-time highs. The stock market could see that the Fed will remain in easing mode for some time to come. But in the meantime, the Dow industrials are reaching still higher into record territory. At last check the Big Board was up 35 points at 21,567. Bonds and gold are giving up some of yesterday’s gains. A 10-year Treasury note yields 2.36%. Gold is back to $1,217. The War on Cash is looking more and more like a strong-arm mafia operation — judging by Visa’s latest gambit. This morning’s Wall Street Journal tells us Visa is approaching a few dozen small merchants with a juicy offer — a $10,000 subsidy to upgrade their electronic payments systems to accommodate “contactless” technology like Apple Pay. The catch? The businesses must stop accepting cash. Visa will extend this offer to as many as 50 restaurants and food vendors. While there’ve been isolated accounts of businesses that won’t take cash — last winter we took note of a handful in big cities refusing cash for safety reasons — cash still accounted for nearly one-third of all consumer transactions during 2015, according to the San Francisco Fed. And not all merchants are eager to fork over the 2% “interchange” fee on every card transaction. “The idea that merchants don’t want to accept cash is a myth,” says Mallory Duncan from the National Retail Federation. But the most zealous anti-cash warriors aren’t lacking for innovative methods to achieve their ends… which brings us to some news from Australia. Down Under the government established something a while back called the Black Economy Taskforce. Its mission — find a way to collect an estimated A$10 billion in revenue that currently goes uncollected because of cash transactions that can’t be tracked. For a while, the task force was kicking around the idea of abolishing the country’s $100 bill, worth about US$77. Instead, they’ve come up with something far more sinister — $100 bills embedded with tracking chips. “You could put a trace on some of these notes to see where they would go. You can use nanotechnology to put little chips in so you could then trace it,” taskforce chief Michael Andrew tells the Brisbane Courier-Mail. As it happens, the article by one Stewart Dougherty is the first time we’ve seen it. “I’m glad your publication has discussed this issue before,” our reader continues, “but the public’s lack of awareness — or, worse, a belief that the charge of manipulation is ‘conspiracy theory’ — is unfortunate. The 5: Thank you for understanding what our mission is here, and why we don’t hammer away at the topic daily. That said, we did perk up at the interview on Fox Business with Terry Duffy, CEO of CME Group — surely a key player in the schemes to keep a lid on the gold price. It’ll be one heck of an I-told-you-so whenever that plays out, huh? “Unfortunately, NFL advertising is not the only thing affected by ED,” writes a reader riffing on one of our quirky items from yesterday. “Conversely, investment and pension funds that failed to capitalize on the resulting stock-o-mania, stayed mired in low-yield bond portfolios. Now fund managers are bailing out of Treasuries and bonds, in order to chase stocks, due to perceived record-low market volatility. “Jim Rickards warned that a volatility spike will occur that will put his ‘avalanche’ theory into motion. It could be a currency and trade war with China. It could be a shooting war with North Korea. It could be a credit implosion due to the Fed enacting quantitative tightening. P.S. After seven years, Louis Basenese has perfected a system to identify “buyout bait” before a lucrative offer comes through and sends a company’s share price shooting higher. With his final refinements to this system, Louis is able to identify which stocks are “marked” by Wall Street. And once that happens, they go up 100% of the time. For access to this one-of-a-kind system, look here.